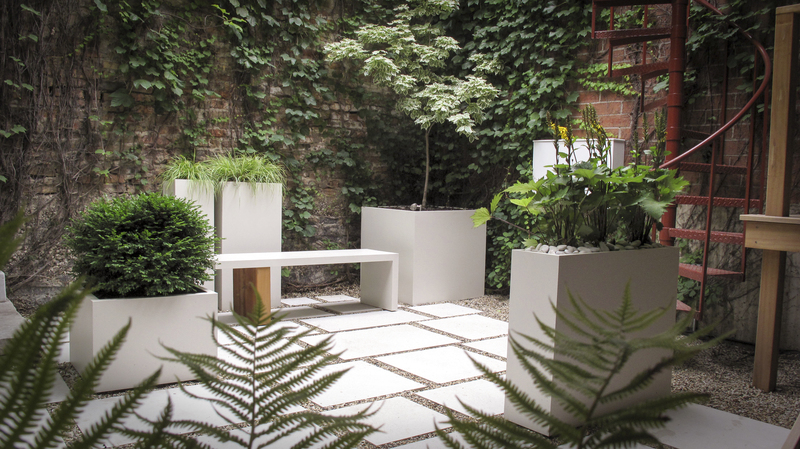 This courtyard sanctuary by Julie deLeon of Groundwork called for a low-profile watering system. Can you spot it? "Both Dan the Aquaman and his colleague Ross, were very professional, timely, and did a fantastic job installing a sprinkler system in the front and back of our house and on top of our garge roof deck. Everything looks very neat and you can hardly notice the sprinklers or the tubing - awesome job! They walked us through exactly what they planned to do before installing anything and then explained how everything worked once complete. We LOVE our new system and it has already made our lives so much easier. We would highly recommend their services!" "I highly recommend Dan the Aquaman. He has been coming to our home for about 5 years now. He comes in the spring to set up our sprinklers for the season, set timers, and make sure everything is in working order. He then comes again for winterizing. He is very nice, and very reasonable. He will even send you reminders for your services which I find helpful with such a busy schedule." "Dan Abu-Absi is the owner and operator of this fine institution which installs watering systems into lawns. The best thing about Dan is that he is wonderfully nice to deal with. He came to my home, which was already completely landscaped and installed a wonderful watering system with minimal damage to existing plants. The system was inexpensive and works very well. Not only that, he also comes out to winter-ize the system so it doesn't freeze over in the winter. This is a wonderful way to not have to water your garden! Thanks Dan!!"